The swingman Andre Iguodala is a professional American basketball player who plays for the Golden State Warriors of the NBA. He is popularly known for his ability to play in multiple positions for the Warriors. During the NBA draft of 2004, the baller was selected by Philadelphia 76ers as the 9th overall pick, he was with the Denver Nuggets before joining the Warriors in 2013. The basketball star isn’t just an outstanding player; he is also a great achiever and has won several awards since the inception of his career. He was named an NBA All-Star in 2012, as well as, an NBA All-Defensive Team twice. Additionally, Andre is a two-time NBA champion and NBA Finals Most Valuable Player in 2015. He is also a two-time Olympic Gold medalist with the United States national team. Read on as we bring you everything you need to know about the swingman, his wife and kids, bio, professional career and other interesting facts below. The swingman was born as Andre Tyler Iguodala on January 28, 1984. He was born in Springfield, Illinois in the United States to African-American parents Linda and Leonard Shanklin. Andre holds American nationality and belongs to Afro-American ethnicity. While he was still a child, he aspired to play for the Chicago Bulls and his role model was Michael Jordan. He attended Lanphier High School located in Springfield, Illinois. Andre was an above average student; best in both academics and athletics. He was listed on the National Roll of Honor; named the State Journal Student-Athlete of the Week several times and also won the All-Conference academic honours. He led his school team to finish second at the Illinois High School Association Class AA competition. Additionally, he was named second-team Parade All-American, Nike All-American as well as Chicago Sun-Times Player of the Year. His high school career came to an end with him winning the Most Valuable Player of the 2002 AAU national tournament. Andre was also placed as No 26 player in the nation and No 6 small forward the same year. Andre Iguodala continued his education and career at Arizona University where he played alongside NBA stars such as Luke Walton and Mustafa Shakur. In his freshman year, Iguodala was named to the Pac-10 All-Freshmen team where he emerged as one of the best all-rounders in the team. The following year, he joined the Sophomore All Pac-10 First team and was named the team’s MVP after taking the lead in assists, steals, and rebounds. He became one of the two players in Pac-10 history to record two or more triple-doubles in a season. Iguodala also signed up with an agent named Rob Pelinka who co-founded the Landmark Sports Agency. The agency is partly responsible for the successful career of some NBA stars including Kobe Bryant. Iguodala finished his college career with 594 points, 409 rebounds, 95 steals and 62 games out of which he started 34. The swingman started his professional career in 2004 after being drafted by Philadelphia 76ers as 9th overall in the NBA draft of 2004. During his rookie season, Andre played all 82 regular season games with an average of 9 points, 3 assists, 5.7 rebounds, 1.7 steals and 32.8 minutes per game. At the end of the season, he was named to the All-Rookie First Team and also finished fourth for NBA Rookie of the Year. Iguodala finished the 2006/07 season as one of the four players to average 18 points, 5 rebounds and 5 assists per game. Others are Tracy McGrady, Kobe Bryant, and LeBron James. The following year, Andre signed a six-year contract extension worth $80 million. The contract also includes $5 million in bonuses and a player option for the sixth year. He was named NBA All-Defensive Team Second Team in 2010/11 season and also made his first All-Star Game the next season. In the 2012/13 season, Iguodala was traded to the Denver Nuggets where he put an impressive performance in the playoffs. The next season, he joined the Golden State Warriors with a four-year contract deal worth $48 million. He won the NBA Finals MVP award after he helped the Warriors to hitch the NBA Championship title in 2015. Additionally, he won the NBA Sixth Man of the Year Award in 2016. He led the Warriors to their second final in series which they lost to Cleveland Cavaliers. He was also part of the Warriors squad that hitched the second NBA Championship in 2017 after defeating Cavaliers in five games, with others such as Stephen Curry, Kevin Durant, Klay Thompson, Draymond Green etc. 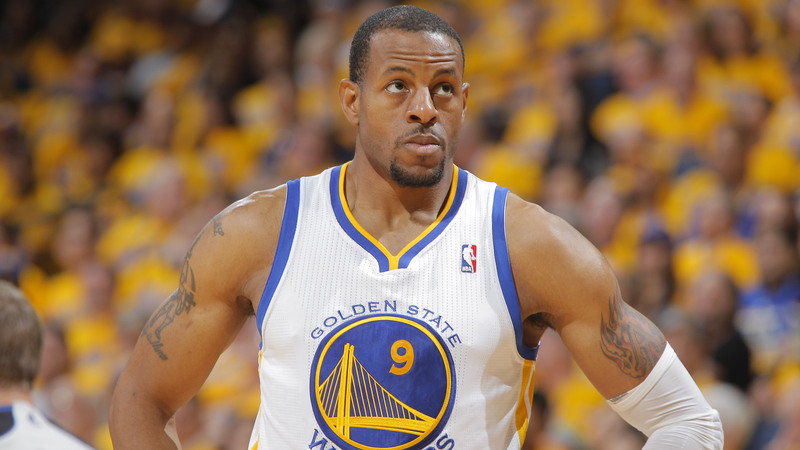 Andre also penned another three-year contract extension with the Warriors in July 2017. The contract is worth $48 million and he became one of the 126 players in NBA history to have played 1,000th regular season game. The multi-talented basketball prodigy is not just a successful player but also a wonderful husband and father of two. He is married to his long-term sweetheart Christina Gutierrez after several years of romantic relationship. Gutierrez enjoys keeping a low profile and nothing much is known about her. The duo sealed their love with a nuptial bond in August 2015. The wedding took place at One & Only Palmilla in Los Cabos, Mexico and was well attended by his teammates as well as close friends and family. The amazing couple was blessed with two children a son named Andre Iguodala Jr. and a daughter named London Iguodala. Prior to their marriage, Andre was previously having an affair with Clayanna Warthen. Reports have it that Andre had his son with his wife Christina while his daughter was a product of his previous relationship. However, Gutierrez and Andre are currently having a blissful married life with their kids. There’s no sign of marital issues or breakup.